From 1928 to 1991, the royal undertakers were J.H. Kenyon Ltd. of Paddington. They therefore undertook the funerals of, amongst others, George V in 1936, George VI in 1952 and Queen Mary in 1953, as well as Winston Churchill in 1965. It is likely that the coffins for all these funerals used the finest cast brass handles and fittings of Newman Brothers’ Gothic range. John Kellettt, a Newman Brothers’ director in the 1950s and 60s, looked after important London clients such as Kenyons. 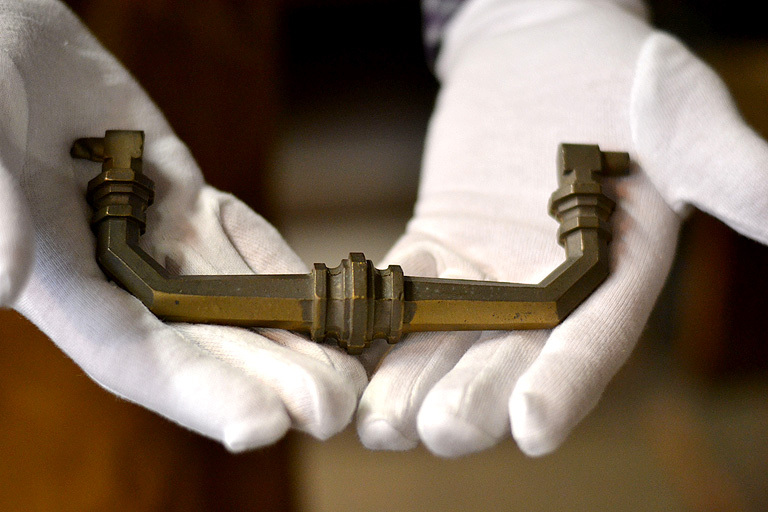 Newman Brothers were very proud to supply the coffin fittings for royal burials. Of course, the royal family had no connection with the firm – it was the royal undertakers who bought Newman Brothers’ products, which is how they ended up on the royal coffins. Likewise, the royal undertakers were involved in state funerals for non-royals such as Winston Churchill. 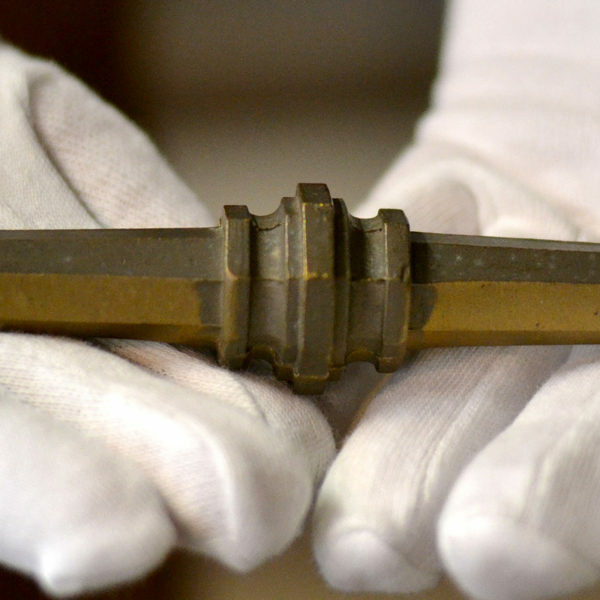 The cast brass gothic handle was in many ways Newman Brothers’ handle of choice. It was the royal undertakers’ handle of choice in any case. Although it was one of the company’s most expensive handles, it wasn’t the most expensive until Newman Brothers rationalised their product line in the 1960s. 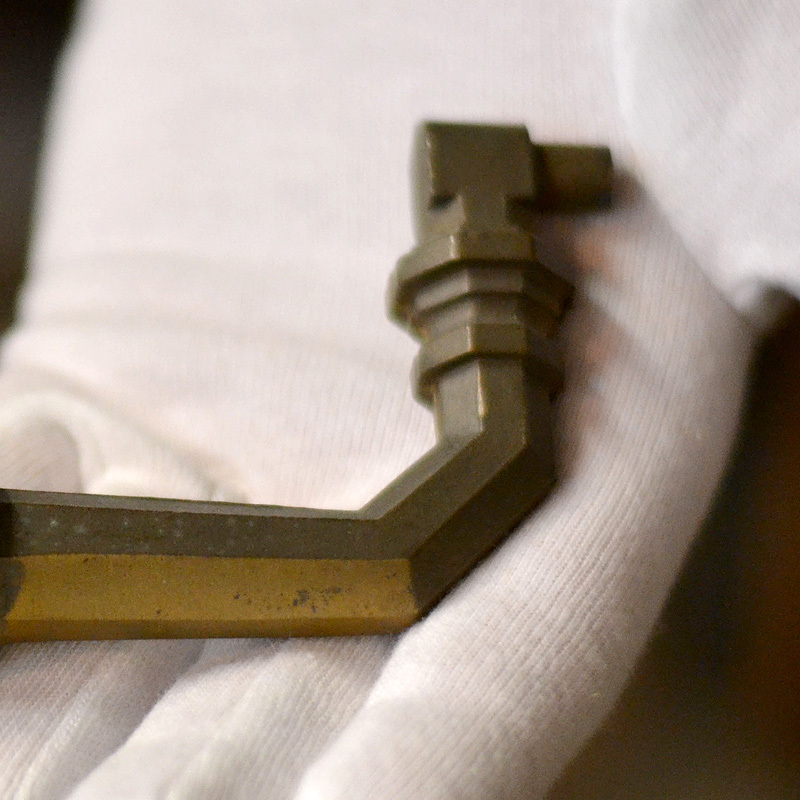 It was produced through the process of sand casting, in which liquid brass is poured into a mould which contains a hollow cavity in the desired shape, in this case a gothic handle, and is then allowed to cool and solidify. Click here to watch a video of the sand-casting process. Anthony Allen was the son of Arthur Allen, a Travelling Salesmen who worked at Newman Brothers from 1903 to 1939. 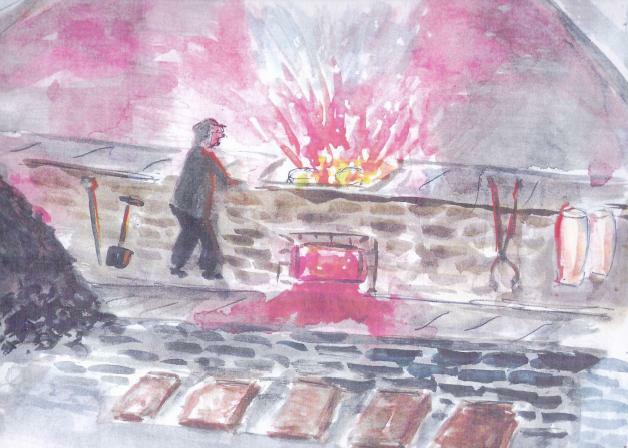 As a boy in his teens in the 1930s, young Anthony loved to visit his dad’s workplace. We interviewed Anthony in 2007 and he recalls how the cast products were made in the video below. 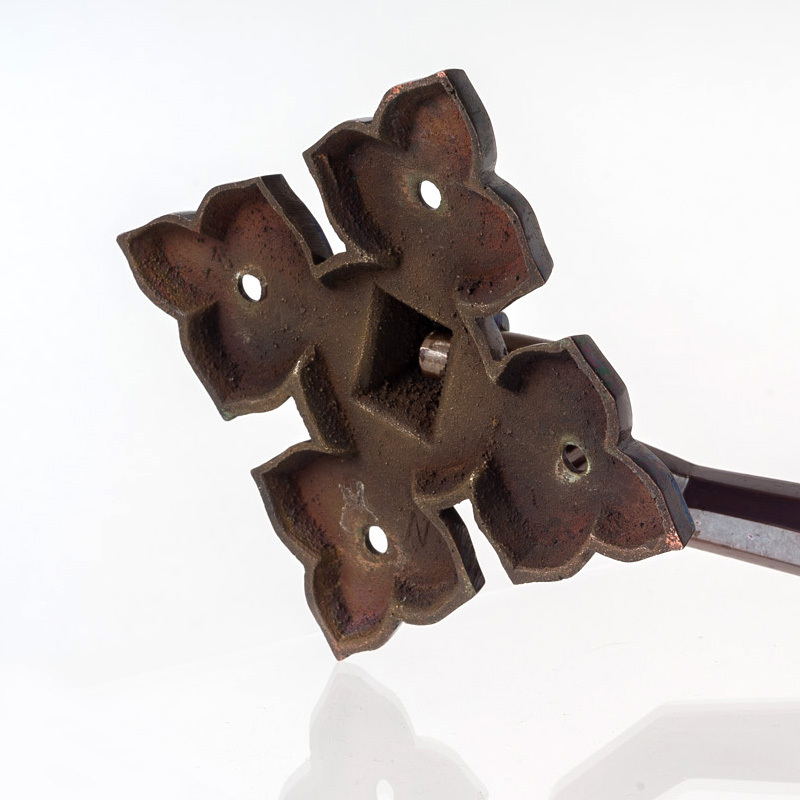 Burnished brass gothic handles, like the example below, would have featured on royal coffins, rather than the brown-bronze version above. Amongst Newman Brothers’ customers were the royal undertakers, and Newman coffin fittings have adorned the coffins of George V and VI, Queen Mary, Princess Diana and the Queen Mother, and most probably all royals in between. Newman Brothers also produced the fittings for great statesmen such as Winston Churchill and many other high-profile people. 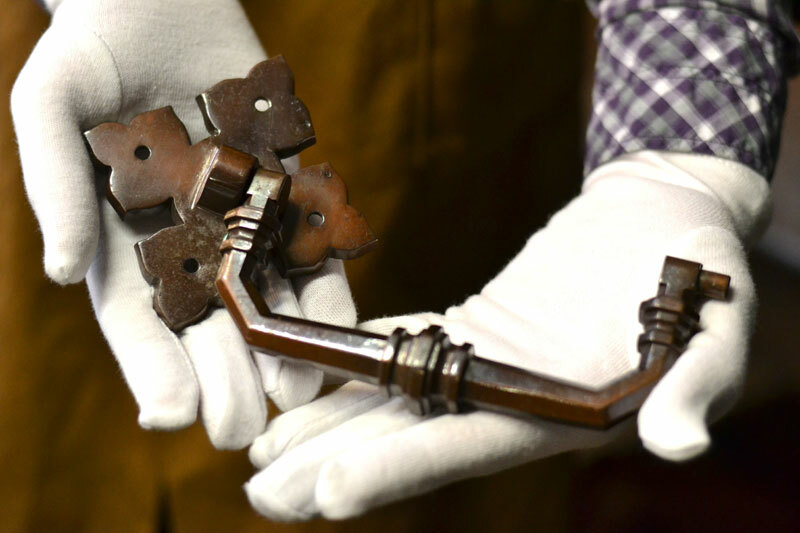 The gothic handle is the handle that Newman Brothers are perhaps best known for because it is the handle that has been used on the coffins of royalty and Winston Churchill among others. 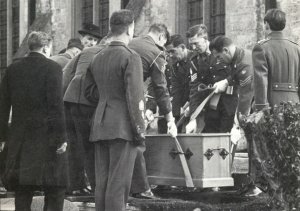 Perhaps the proudest moment in Newman Brothers’ history was to have supplied the fittings for the coffin of Sir Winston Churchill, who died in January 1965. Churchill’s funeral was a huge event in the nation’s history; it was the largest state funeral that had ever taken place, and the live television coverage was watched by millions. J.H. Kenyon, who had been the royal undertakers since 1928, supplied the coffin for Churchill, so it is not surprising that Newman Brothers’ fittings were also used on his coffin as they had been on the royal coffins previously. 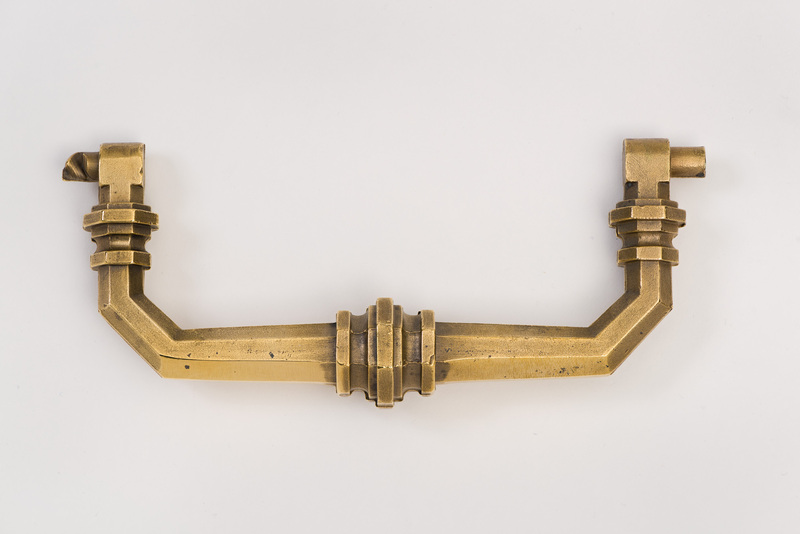 The fittings and handles favoured were from Newman Brothers’ finest cast-brass ‘Gothic’ range. A colleague recalled that Newman Brothers’ managing director, John Kellett was “very well liked in the trade….and did special travelling….to special customers, big customers in London like Kenyons.” It is said that after Churchill’s funeral, Kellett would begin meetings by banging his hand on the table and reminding everyone that it was Newman Brothers that had made Churchill’s coffin handles. The funeral of Sir Winston Churchill, the largest state funeral that had ever been mounted, took place 50 years ago, on 30th January 1965. The code name for the funeral was ‘Operation Hope Not’, and plans for the funeral began in 1953, 12 years before Churchill died. Royal funerals are also planned many years in advance of the requirement for it to take place. Indeed, it is fair to say that the moment an individual succeeds to the throne, their funeral is beginning to be planned. They are what are known as ‘Battle Orders’. Listen to Dr Julian Litten talk about the planning behind royal funerals. Click here to learn more about sand casting at Newman Brothers and the types of products that were produced.